Given that I’ve lost the will to live lately, I haven’t been involved in as much research as is usual. The big project on British dinosaurs trundles on, I’ve been writing lately about the giant Gallotia lizards of the Canary Islands, and an alleged recent manatee sighting off the coast of Washington State has caused me to become involved in a discussion on manatee mobility (go here for more on this subject) and the extinction date of Steller’s sea cow Hydrodamalis gigas. Stoat packs, hominid origins and Britain’s changing herpetofauna have all been on my mind recently, plus I’ve been reading up on the origin of tetrapods: next month I begin an adult education class on tetrapod evolution, and this is one of the areas that I’m going to cover in the first session. The research I’ve been doing on the Gallotia lizards (I’ll blog about them some time in the future, perhaps) got me into the subject of recently extinct, island dwelling reptiles. And that’s good, because I’ve been meaning for a while to write about island dwelling crocodilians (note the mention in the first babirusa post). We now know that small crocodilians inhabited tropical islands in the South Pacific and elsewhere until just a few thousand years ago: judging by these discoveries, small terrestrial crocodilians seem to have been an ordinary component of many tropical island groups until they were made extinct by people. The first of these animals to be discovered was Mekosuchus inexpectatus from New Caledonia, a species that most interested people have heard about due to its coverage in popular books (e.g., Jean-Christophe Balouet’s Extinct Species of the World, Tim Flannery’s The Future Eaters and Charles Ross’ Crocodiles and Alligators [the big Merehurst encyclopedia]). Discovered in 1980, this species entered the literature in 1983 when Eric Buffetaut described its remains (teeth and skull bones) from a site on the Isle of Pines, just off New Caledonia. It was a small crocodilian, around 2 m long, and crushing teeth at the back of its jaws suggest that it ate molluscs on occasion. Based on the apparently archaic nature of its postorbital bar, Buffetaut (1983) speculated that this animal might be a late-surviving relict form from the Cretaceous. By 1987, Buffetaut and colleague Jean-Christophe Balouet had enough material (now from mainland New Caledonia as well as the Isle of Pines) to name the species. They regarded it as distinctive enough for its own family, Mekosuchidae, and they proposed that Mekosuchidae might be a relict group outside of the clade formed by the living crocodilian species (Balouet & Buffetaut 1987). All of this was made more surprising by the fact that M. inexpectatus was essentially modern, with its remains coming from deposits that are certainly less than 4000 years old. The exact age of M. inexpectatus is unsure, but it may have been around as recently as 1670 years ago (Mead et al. 2002). Humans arrived on New Caledonia about 4000 years ago, so it is likely that M. inexpectatus was among the several New Caledonian endemics that were hunted to extinction. Beside the crocodile, these include large megapodes, rails, meiolaniid turtles and a monitor lizard. An association of M. inexpectatus remains with kitchen waste at Nessadiou (200 km north of Noumea) has been reported (Balouet 1989). When first documented, M. inexpectatus was unique and without any apparent close relatives. Thanks to the research of Paul Willis and his colleagues however, we now know that this species was merely among the youngest of a predominantly Australasian radiation of Cenozoic crocodilians, the mekosuchines. To date this group includes generalised Kambara from Eocene Queensland and Australosuchus from Oligocene-Miocene South Australia, short-skulled Miocene Trilophosuchus from Queensland, the broad-snouted Oligocene-Miocene Baru* species, broad-snouted Pliocene-Pleistocene Pallimnarchus, and ziphodont** Miocene-Pleistocene Quinkana from Northern Territory and Queensland (Salisbury & Willis 1996, Willis 1993, 1997, Willis & Mackness 1996, Willis & Molnar 1991, Willis et al. 1990, 1993). A few unnamed Australian species, including some peculiar long-snouted, gharial-like forms, are also probably members of the mekosuchine radiation, and we’ll meet more members of the group in a minute. Mekosuchines aren't regarded as a distinct 'family' anymore, incidentally (as was proposed by Buffetaut and Balouet). 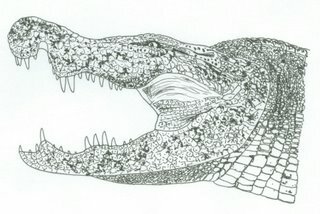 Rather, they seem to be a clade within the larger group Crocodylidae [adjacent image is a life restoration of Baru darrowi, by me]. * There are several Baru species, but the first one to be named is B. darrowi. The specific name honours Paul Darrow, the British actor ‘best known for his role in the television series ‘Blake’s Seven’, in recognition of his support of continuing palaeontological investigation of the Riversleigh deposits’ (Willis et al. 1990, p. 522). ** Ziphodonty describes a tooth type where the teeth are recurved and laterally compressed. It is most often associated with theropod dinosaurs. Some mekosuchines probably behaved much like living amphibious crocodiles – indeed they evolved in an Australia that was initially devoid of the modern Crocodylus species that first appeared there in the Pliocene, but others, like Quinkana, appear to have been terrestrial predators that might have behaved like giant monitor lizards. Judging by its limb bone morphology and the places where its remains are found, M. inexpectatus was a terrestrial form and it has even been suggested that it might have been scansorial: that is, able to climb trees. This isn’t regarded as likely by all fossil crocodilian experts. In the initial draft of an article I wrote about crocodilian history (Naish 2001) I mentioned that Mekosuchus might have been a tree climber. My reviewer (a noted crocodilian expert) crossed this out, writing in the margin ‘Do you want to remain a credible scientist’? Anyway, it is an idea still worth considering. So M. inexpectatus was a member of a previously diverse group, the mekosuchines. Furthermore, recent discoveries from the Oligocene and Miocene of Queensland have revealed a fossil history for Mekosuchus extending well back, on mainland Australia, into the Neogene (Willis 1997). This is significant as it shows that Mekosuchus must have gotten to New Caledonia after evolving on Australia (it therefore wasn’t an island endemic, unique to New Caledonia). Furthermore, M. inexpectatus is comparable in size to the Australian Mekosuchus species, so its small size probably isn’t a specialisation for island life [the image at the top of the page depicts the Australian Mekosuchus species M. sanderi. It's one of Paul Willis' photoshop reconstructions. Visit reconstructing dead Aussie crocs for more]. Another island-dwelling Mekosuchus species, M. kalpokasi, was described in 2002 for skull material from the archaeological Arapus site of Efate island, Vanuatu. Discovered associated with pottery fragments, bivalve shells, and bones of fish, fruit bats, turtles and birds, M. kolpokasi comes from a layer radiocarbon dated at about 3000 years old. Again, its association with human waste and evidence for hunting strongly indicates that its extinction was caused by humans. The maxilla of M. kalpokasi clearly comes from an adult individual and has a tooth row of just 88.7 mm long, so again this was a small animal perhaps less than 2 m long. The shape of the maxilla also shows that M. kalpokasi was a short-skulled species, as were probably all Mekosuchus species. So Mekosuchus wasn’t just found on Australia and New Caledonia – it also got as far west as Vanuatu. Might mekosuchines prove to have been even more widely distributed? Yes, for in 2002 Molnar et al. (2002) described another island dwelling form, Volia athollandersoni. Its name commemorates Voli Voli Cave (one of the discovery sites) and Atholl Anderson, well known for his many contributions to the prehistory and palaeoecology of south-west Pacific islands. Volia is from Viti Levu, Fiji, and again it was apparently a relatively small (2-3 m long), terrestrial form. It is Pleistocene in age, with one cave deposit that yielded it being dated at between 10,000 and 20,000 years old, though it can’t be ruled out that some remains of this species are younger than this. People have been on Fiji since about 3000 years ago, so at the moment Volia seems too old to have succumbed to human hunters. I would predict, however, that it actually survived to the time of human occupation, and only then became extinct. A giant frog, a terrestrial turtle, an iguana, rails, a snipe, pigeons and megapodes all became extinct on Fiji as a result of human intervention. How did mekosuchines get to these islands, and what does this mean for their total distribution? There are two competing views here. View one – the dispersal model – states the following: given that mekosuchines as a group are younger than the rifting events which separated Fiji and New Caledonia from Australia, it seems most likely that they colonised the islands in their range by dispersal (Mead et al. 2002). That is, they swam to them. This means that the mekosuchines ancestral to the island dwelling forms must have had some marine swimming/drifting capabilities (much as do some living Crocodylus crocodiles). This dispersal model suggests that island dwelling mekosuchines might have occurred on various islands where they have yet to be discovered, such as Tonga, Samoa, Santa Cruz, the Loyalty Islands, and various of the islands that form Vanuatu and Fiji (Mead et al. 2002). We have only recently (viz, post-1980s) discovered that Fiji and Tonga were home to recently extinct big frogs, iguanas, giant pigeons and other tetrapods, so it is quite conceivable that the fossils of such mekosuchines await discovery on some of these islands. It’s also worth checking native traditions and old historical accounts to see if the people who lived on, or visited, these islands ever reported anything that sounded like a terrestrial crocodile. I’m not aware of any such accounts but then I can’t pretend to have checked the relevant anthropological or historical literature. Balouet (1989) did report that New Caledonian people lacked any traditions of an animal that sounded at all like Mekosuchus. 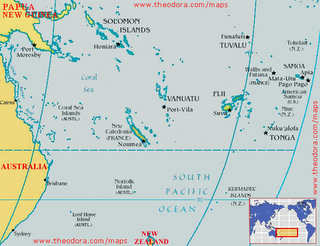 View two – the vicariance model – proposes that mekosuchines may have been present on New Caledonia, Fiji and elsewhere prior to their separation of these land masses from the Australian plate. A few pieces of evidence suggest that this is plausible. We now know that crocodilians were present on New Zealand as recently as the Miocene, and it was intimated by Molnar et al. (2002) that this might support a vicariant origin of island dwelling crocodilians in the south-west Pacific. Molnar et al. (2002) also pointed to the presence of the frog Platymantis on Fiji as evidence for a vicariant origin of at least some of the tetrapods on these islands, though it’s worth noting that the old chestnut about frogs being incapable of dispersal across salt water is no longer viable (Vences et al. 2003). If vicariance was the major control on mekosuchine distribution in the south-west Pacific, then mekosuchines ‘might be expected to be found on other islands in the New Zealand-New Caledonia-Fiji-Solomons region, but not as far east as Tonga or Samoa’ (Molnar et al. 2002, p. 626). So whether mekosuchines owe their distribution to dispersal or vicariance, we can be quite confident that they inhabited islands in the south-west Pacific where their presence has yet to confirmed. This isn’t the end of the story. Mekosuchines weren’t the only recently extinct crocodilians that inhabited the island groups of the south-west Pacific. Furthermore, island dwelling crocodilians also inhabited islands in the Indian Ocean until very recently. And that’ll have to wait until next time. For the latest news on Tetrapod Zoology do go here. Balouet, J.-C. 1989. New Caledonian crocodile (Mekosuchus inexpectatus). In Ross, C. A. (consulting ed.) Crocodiles and Alligators. Merehurst Press (London), p. 36. - . & Buffetaut, E. 1987. Mekosuchus inexpectatus, n. g., n. sp., crocodilien nouveau de l’Holocene de Nouvelle Calédonie. Comptes Rendu de l’Academie des Sciences, Paris, Serie II 304, 853-856. Buffetaut, E. 1983. On the late occurrence of an archaic crocodilian in the Pleistocene of the Isle of Pines (New Caledonia) and its biogeographical significance. Comptes Rendu de l’Academie des Sciences, Paris, Serie II 297, 89-92. Mead, J. I., Steadman, D. W., Bedford, S. H., Bell. C. J. & Spriggs, M. 2002. New extinct mekosuchine crocodile from Vanuatu, South Pacific. Copeia 2002, 632-641. Molnar, R. E., Worthy, T. & Willis, P. M. A. 2002. An extinct Pleistocene endemic mekosuchine crocodilian from Fiji. Journal of Vertebrate Paleontology 22, 612-628. Salisbury, S. W. & Willis, P. M. A. 1996. A new crocodylian from the Early Eocene of eastern Queensland and a preliminary investigation of the phylogenetic relationships of crocodyloids. Alcheringa 20, 179-226. Vences, M., Vieites, D. R., Glaw, F., Brinkmann, H., Kosuch, J., Veith, M. & Meyer, A. 2003. Multiple overseas dispersal in amphibians. Proceedings of the Royal Society of London B 270, 2535-2442. Willis, P. 1993. Trilophosuchus rackhami gen. et sp. nov., a new crocodilian from the early Miocene limestones of Riversleigh, northwestern Queensland. Journal of Vertebrate Paleontology 13, 90-98. - . 1997. New crocodilians from the late Oligocene White Hunter Site, Riversleigh, northwestern Queenslands. Memoirs of the Queensland Museum 41, 423-438. - . & Mackness, B. S. 1996. Quinkana babarra, a new species of ziphodont mekosuchine crocodile from the Early Pliocene Bluff Downs Local Fauna, northern Australia with a revision of the genus. Proceedings of the Linnean Society of New South Wales 116, 143-151. - . & Molnar, R. E. 1991. A new middle Tertiary crocodile from Lake Palankarinna, South Australia. Records of the South Australian Museum 25, 39-55. - ., Molnar, R. E. & Scanlon, J. D. 1993. An early Eocene crocodilian from Murgon, southeastern Queensland. Kaupia 3, 27-33. - ., Murray, P. & Megirian, D. 1990. Baru darrowi gen. et sp. nov., a large, broad-snouted crocodyline (Eusuchia: Crocodylidae) from mid-Tertiary freshwater limestones in Northern Australia. Memoirs of the Queensland Museum 29, 521-540. I thought Fiji, let alone Vanuatu, were purely volcanic, that is, oceanic crust (though Fiji is very old for a volcanic island)? Yes, Fiji and Vanuatu are of volcanic origin, but both are part of the Fijian Plateau, an area that is thought to have had emergent land since the Eocene. Until the Palaeocene/Eocene (I'm not sure which), the Fijian Plateau was adjacent to the north-west coast of Australia, and it was at this time that it began to rift away in a north-westerly direction. Prior to this rifting, it is conceivable that some faunal elements were continuous across Australia-Fiji-Vanuatu. I perhaps should have stressed in the post that I personally prefer the idea that mekosuchines dispersed to the Pacific islands. But we'll see. I'm starting to notice a common theme to many of your posts: that the diversity of extant and recently-extinct tetrapods is considerably greater than what has so far been described. Cataloguing the world's biodiversity is a labor-intensive task; never mind millions more beetles to be described, we don't even know all the mammals that are out there. Would you say that this emphasis on diversity is one of the central concerns of scientifically-responsible cryptozoology? I must point out that I'm not trying to create posts that have a common theme - I'm generally just writing about those things that I (i) bump into during research and (ii) find really interesting. Regardless, I'd say that newly discovered diversity is one of my major interests. Is this 'emphasis on diversity' of central concern to cryptozoology? Well, cryptozoology is primarily concerned with documenting ethnoknown animals, and then determining whether or not they actually exist. Certainly this work contributes to our discovery of diversity, but I don't think this is what cryptozoologists have in mind - they are essentially 'target focused'. Whatever, there is certainly a great deal more to find, and that goes for whatever estimates of species diversity you follow. I´ve been looking for information about recently extinct mekosuchine crocodiles since a long time, but this is definitely the best source I found yet. I wanted to make some reconstruction-drawings, but sadly I couldn´t find any good pictures of Mekosuchus or Volia athollandersoni, which I could use as reference. I have a very nice picture in a book, but it isn´t neither very "dog-snouted" nor shows it a comparably high skull but lateral nostrils, furthermore, the tail looks somewhat over-elongated . I have found the drawing of a partial skull-reconstruction of V. athollandersni, but it shows clearly dorsal, and no lateral nostrils. The photoshop reconstructions of Paul Willis look very good, but they show not much details. I´m very curious if finds of other recently extinct mekosuchine species will be made in the future. What I found also very interestingly is your mention of Meiolania on New Caledonia. I have already asked me when this strange tortoises really died out, and also why. The most recent finds about which I could find information were those from Lord Howe. They are about 20.000 years old, surprisigly young, especially when you keep in mind that only "some" miles near this isle, the Australian continent was already colonized by humans since more than 10.000 years. I would not rule out that Meiolania was killed by australian sea-farers who visited occasionally the small island. Despite their horns and mace-like tails, I would not think that they had much defense against human hunters. But this is only speculation, and I know that such a small island like Lord Howe Island is especially vulnerable to natural disasters which could erase a population of Meiolania in an natural way. I don´t know how old the most recent fossils from New Caledonia are, but it would be strange if such an animal like a giant turtle (which are in general great in surviving droughts, storms and other natural disasters which kill many other species)would become extinct on such a big island, and other members of the native megafauna, even carnivores like V. athollandersoni, would survive in historic times. I could well imagine that there are still somewhere fossils of Meiolania on New Caledonia which show markings of butchery. In this case, this fascinating animals which could have well played in a Ray Harryhausen-movie, survived even in historic times, and not like normally stated, in the Pleistocene. Were there really monitors at New Caldonia? I always thought they were absent from this island and that Mekosuchus played the part which was normally possesed by big monitor lizards. I knew only from Lapitiguana impensa and Brachylophus gibbonsi as contemporaries of island-dwelling mekosuchine crocodiles. BTW, if you ever need some photo material from large gallotia lizards of the Canary islands, I have still plenty of photos of Gallotia stehlini I made last year at Gran Canary. Thanks for your comments Sordes. Yes there was a varanid on New Caledonia, it's been mentioned by Michael Balouet in his books and papers a few times, and is also mentioned in Flannery's The Future Eaters. I don't know if it's yet been properly described (must check). As you note, this raises a possible problem with the idea that small mekosuchines played the role that varanids did elsewhere. I do indeed need photos of Gallotia.. please email me so we can discuss this further (eotyrannus at gmail dot com). Thanks for the offer! I discovered a few weeks ago that my parents have some photos of a big Gallotia (probably G. stehlini) that they took while on holiday. There are some excellent photos here. Hallo Darren, I just sent you some photos of G. stehlini. I asked me also what this mekosuchine crocodiles ate. The blunt teeth in the posterior region of the jaws seems to be well-suited to deal with hard-shelled prey. In literature I only read about hard-shelled molluscs, but I had also the idea that terrestrial crustaceens like the coconut crab were probably also a part of its diet. Given the fact that most crocodiles are very opportunistic, I could also imagine that this animals hunted probably at least some of the flightless birds of their home-islands. I calculated a weight of about 40kg for a 2m long Mekosuchus, this would be probably even enough to kill an adult Sylviornis.